Skylab astronauts took this photograph as they approached the orbiting laboratory on the the third and final mission, known as Skylab 4, in November 1973. Before the International Space Station existed, before U.S. astronauts shared space on Russia's space station Mir, America's first home in Earth orbit was Skylab. The converted upper stage of a massive Saturn V moon rocket, Skylab was launched 40 years ago today (May 14). The orbital workshop gave NASA its first experience at establishing a long-duration human presence in space, laying the foundation for American astronauts to take up continuous residency almost three decades later on board the International Space Station (ISS). "When these guys went to the final frontier to stay for a long time, they did it as the first ones, the ones who were entering the unknown and to see what it was going to be like and set the stage for us," said astronaut Kevin Ford, who returned from space in March after commanding the International Space Station's Expedition 34. "It is a pleasure for me to be here on the 40th anniversary." Three crews of three astronauts each launched to the Skylab space station between May and November 1973. Each mission set a record for the amount of time that crewmembers spent in space — Skylab 1 for 28 days, Skylab 2 for 59 days and Skylab 3 for 84 days. "It verified the fact that people could live, work [and] do productive things for long duration, and also took the first steps toward doing the science that we wanted to have aboard," said Owen Garriott, who served as the science pilot for Skylab's second crew. That astronauts were even able to spend one day aboard Skylab was a testament to the value of having humans in space. International Space Station Expedition 34 commander Kevin Ford (right) presents Skylab astronauts Owen Garriott (left) and Gerald Carr with space-flown flags to mark the 40th anniversary of their missions on board America's first space station, May 13, 2013 at NASA Headquarters in Washington, D.C. Excessive vibrations during the station's Saturn V liftoff resulted in a critical meteoroid shield being ripped off in flight, which in turn took out one of the orbital workshop's two power-providing solar arrays. Flight controllers moved Skylab's secondary solar panels to face the sun to provide as much electricity as possible, but because of the loss of the debris shield this caused the station's interior to heat up to over 125 degrees Fahrenheit (52 degrees Celsius). The effort to "save Skylab" fell to its first crew, who had to quickly prepare for a series of unexpected spacewalks in the short time they had between the station's launch and their own. Despite the very tight schedule, the astronauts successfully deployed a parasol (later augmented by a solar shield) to lower the temperature inside the station and freed a snagged second solar array. Once the workshop was a stable living platform, the three Skylab crews logged about 2,000 hours in total performing scientific and medical experiments. They also took more than 46,000 photos of the Earth and 127,000 photos of the sun, capturing eight solar flares on film. Astronaut Gerald P. Carr, commander for the Skylab 4 mission, jokingly demonstrates weight training in zero-gravity as he balances Astronaut William R. Pogue, pilot, upside down on his finger. The astronauts also devised methods for maximizing their productivity, a lesson with far-reaching applications. "We dealt with problems having to do with scheduling and productivity," said Gerald "Jerry" Carr, who commanded the final Skylab crew. "We came to some solutions that worked very well. It took a while to get there ... but those solutions that we came across were used on subsequent missions to some degree." "We tried to make sure that got into the planning for the operations aboard the International Space Station and on the [space] shuttle," Carr added. "I think we're still working that issue," replied Ford. "We've gotten a much better feeling, I think, now that we are up there to do work that the ground can't necessarily figure out how long it is going to take you to do everything." This illustration of Skylab shows the Apollo capsule, which was launched on a Saturn 1B rocket to ferry crews to space, docked to the multiple docking adapter, which was designed and built at NASA's Marshall Space Flight Center in Huntsville, Ala. Upon the end of its crewed missions, Skylab was moved into a stable attitude where it was expected to remain for eight to 10 years. It was hoped that one of the early space shuttle missions could be used to re-boost Skylab's orbit to save the station for future use. An oxygen tank from the Skylab Space Station, the largest of several pieces that were recovered from America’s first space station following its reentry in 1979, wrapped in protective plastic. 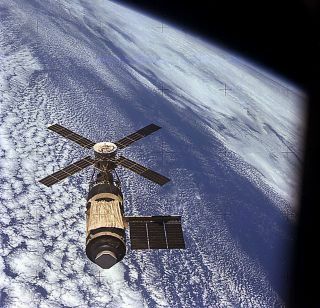 Despite its relatively short life span, the use of Skylab's unique environment and vantage point represented a major step in the United States' spaceflight efforts, serving as a bridge between the Apollo missions to the moon and the long-duration expeditions on board the International Space Station, the roundtable said. "The [International] Space Station was built around what we learned on Skylab," Ford said. "What they put up there for us, the way the modules were sized and the way they were constructed in space... that all came out of what we learned from Skylab." "We may have done it first, but these guys are doing it better," added Carr, referencing Ford and the current ISS crews. "People need to continue to do it better and better because we learn more and more as we do this. We just took the first step, and the rest of the steps are having had been taken and are being taken right now."